The time has come to update Lucas’ bedroom. When we first decorated he was about to move into the smaller room (to make space for two baby brothers) and we chose lots of bright colours and car stickers to make it fun for a nearly two-year old. It has served him well but all of a sudden it seems way to young for him. Now it needs to be a proper boy’s bedroom and on top of that we need to get him a new bed, those pesky brothers of his are ready for his toddler bed so he will be treated to a brand new one. Little did I know how difficult this would be, his tiny room is actually so tiny that it won’t fit in a full size single bed which meant I have been hunting out some of the best options to make the most of the space. As much as I loved the idea of a cabin bed it would have to go against the wall with the window which means his bed would be above the window – I wasn’t too keen on that idea. After a lot of research, hours spent with me grumbling at the internet and cursing our new build home, the SUNDVIK extending bed from Ikea seemed like the best option. It can be extended as the child grows and we should be able to fit it into the space available…I hope! I find it so much easier to put everything together like this and see what I like. I didn’t want to go for a theme as such but it is a bit of an outdoors/explorer/adventurer style. I still want something that Lucas will love but not that he’ll grow out of in a year. He absolutely loves his Atlas and looking up countries and animals so a massive world map was a must. I have a house shaped shelf ready to go up and fancy a couple of the wooden ones from Ikea to put all his treasures on, I’m thinking binoculars and a compass can find there way on there too. 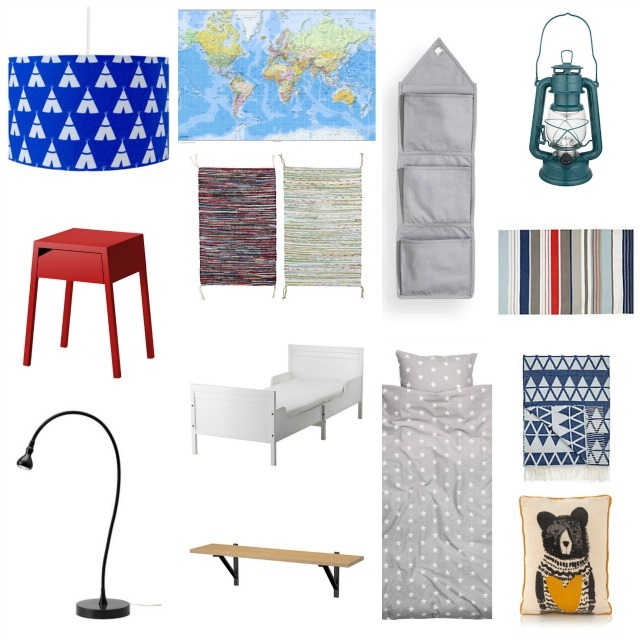 I love the little bear cushion from George Home and the hurricane style lamp from John Lewis. I’m not sure we quite have the space for a desk but the red bedside table will fit perfectly. I want to frame some photographs and prints to go in there but I’m still trying to choose my favourites. I’m looking forward to making a start on it and seeing it all come together. The difference with decorating now he is four is that he has started to give his opinion on the room too, his has his own ideas for a boy’s bedroom. His requests so far include three beds and a whale cushion (only one of those is a possibility). When this is all done we will be onto the twins room! Check out my Pinterest board for more boys bedroom inspiration and any advice on making the most of a tiny bedroom would be greatly appreciated. Follow Hayley From Home’s board Home : Boys Bedroom on Pinterest. I know, it always seems like so much more fun to decorate a kids room doesn’t it? I guess you can be a bit more quirky and get away with it with children! I love this little mood board, I think our daughter owuld love a world map for sure. As soon as I started reading I thought of the extending beds from Ikea! You have some gorgeous items picked out Hayley. I particularly like the red table and the bear cushion. I would love them for myself, never mind my three boys! I love it, such gorgeous pieces! They grow up so fast don’t they, Skye has her own ideas now too about how she wants her room to look etc, but she is sharing with Sophia so it’s all abit of a mix at the moment!